Today’s top-tier workforce is socially savvy and wants to be a part of an organization that is giving back. By investing resources in your local community, your employees become more invested in your corporate culture and more willing to play a larger role in its success. We invite you to support Warren County Habitat's unique approach to affordable homeownership. Our mission is to provide a “hand-up, not a hand-out” to low-income families willing to invest their own sweat equity into the construction of their home. Opportunity for 70 employees to join in up to 8 build days a year. Thank you ad placed by Warren County Habitat in a regional community newspaper. Prominent placement of company logo on signage at sponsored build site and in the home dedication ceremony printed program. Inclusion in a press release prior to the home dedication ceremony highlighting the company’s sponsorship with Warren County Habitat. Invitation to and speaking opportunity during the home dedication ceremony with our Warren County Habitat family. 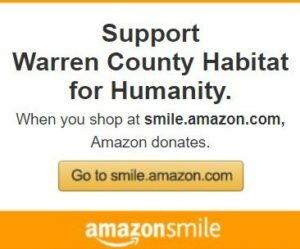 Social media campaign and spotlight feature on Warren County Habitat website and social channels. Logo placement on Warren County Habitat homepage, with a link to the company’s website. Recognition in Warren County Habitat’s annual report. Opportunity for 30 employees to join in up to 4 build days a year. Invitation to a home dedication ceremony with our Warren County Habitat family. Opportunity for 10 employees to join in up to 3 build days a year. Listing in the home dedication ceremony printed program. Recognition on Warren County Habitat social channels. Logo placement on Warren County Habitat website. Opportunity for 50 employees to join in up to 6 build days a year. Invitation to and speaking opportunity during the home dedication ceremony with our Warren County Habitat. Opportunity for 20 employees to join in up to 3 build days a year. NEED TO ACCOMMODATE A LARGE GROUP? Ask about Warren County Habitat Corporate Build Day opportunities – tailored for large corporate groups looking for fun, unique, and rewarding team-building experiences.